In April, exchange alumni Nora Al-Othman and Abdul Aziz Al-Mutairi organized a forum on disability issues in Ahmadi, Kuwait. The pair partnered with Training Gate International (TG-I), a leading organization in assessing the needs of the disabled community in Kuwait. Nora, an International Visitor Leadership Program (IVLP) alumna, is the Deputy Director of Training Gate International. Established in 2009, TGI is the first and only organization in Kuwait to specialize in human resources development with a focus on training and skills development for people with disabilities. When constructing the forum’s program, Abdulaziz Almutairi, an alumnus of the U.S.-Middle East Partnership Initiative (MEPI) Leadership Democracy Fellowship (LDF), provided valuable insights as a disability rights advocate. Muna Al-Buloushi, a Fulbright Language Teaching Assistant (FLTA), and Leaders for Democracy Fellow (LDF) alumna, assisted Nora and Abdul in organizing the event. The forum was part of the recently launched KELNAQ8 Initiative. Translated, the acronym means “We are all Kuwait.” KELNAQ8 is an awareness campaign, which supports educating, training, and integrating people with disabilities into the educational system, work force, and society. The Kuwait Oil Company in Ahmadi co-sponsored the event, which was attended by Kuwaiti officials, students from the public school system, Kuwait University representatives, and the Public Authority for Applied Education and Training (PAAET). 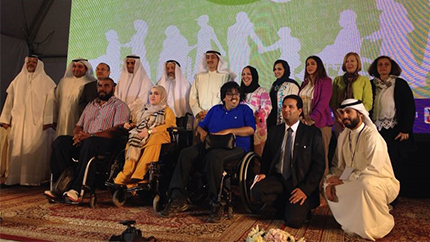 The forum’s guest speakers included five members of the disabled community in Kuwait. They shared their experiences as persons with disabilities and discussed their future aspirations. The speakers commended TG-I for providing employment training and skills development to persons with disabilities, and for helping them communicate their needs to the Kuwaiti public.